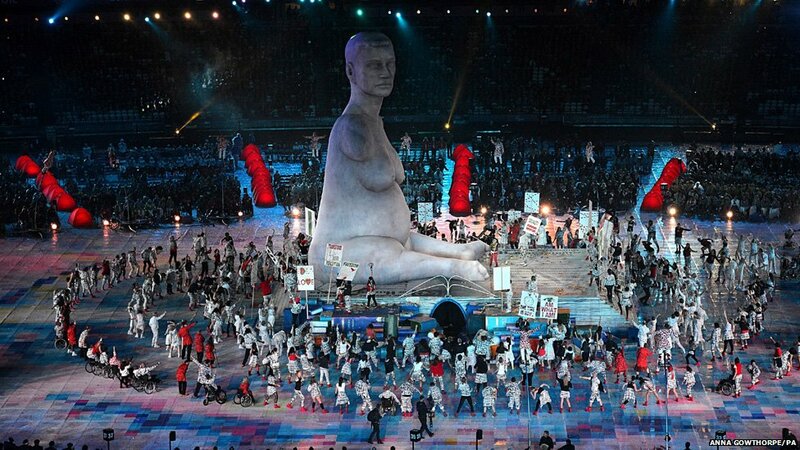 Orbital and the Graeae Theatre Company (made up of actors and musicians with various disabilities) performed a version of Ian Dury’s Spasticus Autisticus at the Paralympic Opening Ceremony last night. It featured excerpts of a Brief History Of Time read by Professor Stephen Hawking's voice (who was there in person and donned a pair of Orbital ‘torch’ glasses). It was amazing, especially when you think how controversial the song, originally written in 1981 for the International Year Of The Disabled, has been: deemed by many to be “too offensive”* (*translation: too in-your-face, defiant, and uncomfortable). 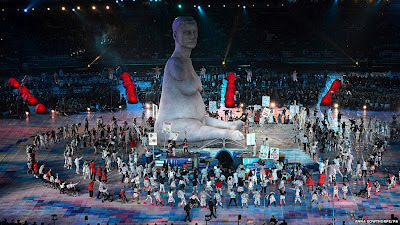 Also in the stadium was a giant Mark Quinn statue of the disabled artist Alison Lapper. Earlier, the GB team had tucked their ATOS sponsored lanyards into their tracksuits as a pointed protest at the company which is currently carrying out the Government’s widely-lambasted disability assessments that have caused misery and pain to so many disabled families. Britain’s first Paralympic gold medal winner, 84-year-old Margaret Maughan, lit the petals of Thomas Heatherwick's stunning Olympic cauldron from her wheelchair. At its peak, Channel 4's coverage of the ceremony attracted 10.9 million viewers. My daughter, who has a rare chromosome disorder called Prader-Willi Syndrome, was just too tired to stay up, but the whole shebang is recorded, and today we’re going to watch it together. Then next week, thanks to us lucking out in the prize draw at her special school sports day, we're going to the Olympic Stadium to watch the athletics. Tonight's ceremony made me more proud than ever to be the mum of a disabled child. It made me proud to stick two fingers up to any idiot who thinks she’s somehow ‘less’ than anyone else. As Stephen Hawking said tonight: "There is no such thing as a standard or run-of-the-mill human." EDIT: Video of the track that stopped me in my tracks (now up on You Tube). If you want to check out the Ian Dury & The Blockheads' original, click on my previous blog post Ripples. Special Forces do it with white noise. My daughter does it with her precisely pitched, heat-seeking missile voice. On a good day, I can laugh about it, or filter it out, and let it wash over me. On a day like today, I’m willing to give her my name, rank, serial number, and my secret D-Day plans, if only she would promise to STOP. My girl’s chromosome disorder means she’s prone to perseveration. She has more repeats than episodes of QI on the Dave channel. If a thing's worth saying once, it's worth saying 50 times. Sometimes it includes a long run-up: she’ll start a sentence, lose track in the middle and begin again, only to stumble at the same point, and repeat the slow-mo stutter. There are ways to deal with this: Gently asking her to take a breath and concentrate; reminding her that she’s already said the same thing (although this can backfire, and she’ll end up repeating “I’m not going to repeat myself”); and sometimes simply walking out of the room and taking a moment to remind myself that she can’t help it. Lately, it’s been more difficult. Her voice has changed. It’s become more nasal, louder, and has developed a declamatory tone. She’s started to talk like she’s READING... EVERYTHING... OUT... even when she's just announcing that she's going for a wee. Her tone is deliberate, slow, piercing, and slightly robotic. She slips in some words as reassuring totems for herself: “Hell-o Kitt-y”, “Top-sy and Tim”, and “Lib-rar-y”. I’m not sure what’s causing this. She seems to have become acutely aware of her mouth and lips when she speaks, mouthing shapes and whispers in between words, which is oddly disconcerting as from the other side of the room it looks like she’s in a badly-dubbed martial arts movie. Is the possibility of having a brace for her teeth preying on her mind, or is it another worry - perhaps that she's starting her new school soon? 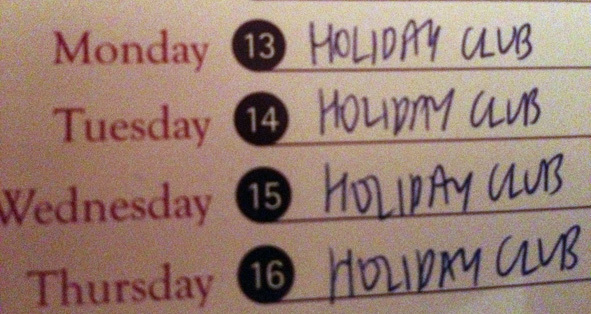 I’m hoping it’s simply a case of Familial Cabin Fever (on both our parts), otherwise known as Bloody Hell, It’s The Fifth Week Of The Summer Holidays, Surely They’re Over Soon Syndrome. 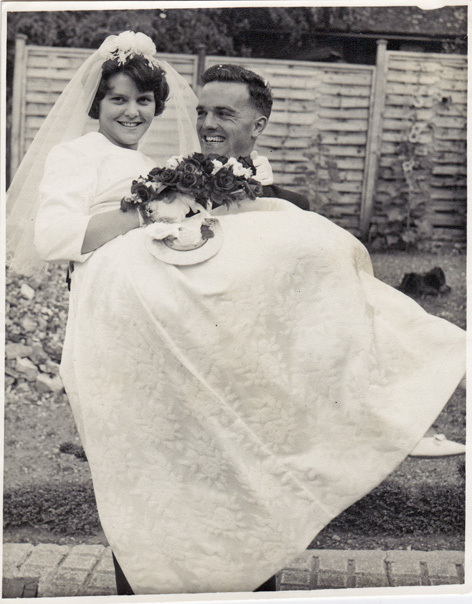 Fifty years ago today my Mum & Dad got married. The black and white photos of the big day show an impossibly young-looking Dad with a kind of pudding bowl quiff hairdo, the legacy of national service. Mum looks film star glamorous. Dad is gazing at her with complete adoration. He hasn’t stopped looking at her like that ever since. They’re having a party today, along with almost all of the people I love most in this world, including their three children, eight grand-children, and one great-grandchild. I’ve got to make a little speech. I’ve not worked out exactly what I’ll be saying yet, although I know I’ll be mentioning how Dad fought off a battalion of other suitors, including Alan Bentley, who jived with Mum in the school cellars, and Darcy Smart, who took her up to Goodwood (which, believe it or not, is not a euphemism). Everyone there loves them to bits. Everyone knows how kind, generous, funny and thoughtful they are. Everyone knows how much they adore eachother. My lovely, loved-up, golden Mum & Dad. We weren’t going to go on holiday this year. After moving house and getting all our building work done, we’re not exactly flush. In fact, we lifted up our piggy bank, tipped it up and shook it so hard that not only did every last penny fall out but so did the pig’s lower intestine. Then my mate came up with a plan. She’s off to the Cotswolds for a week, and her house is going to be empty. So she phoned me and asked if we’d like to holiday in her home. It’s not a cottage near the beach. It’s not next to any major tourist attractions. It’s only about 25 miles away from where we live, and just down the road from where we used to live. But it’s a lovely house, with a big back garden, and lots of toys for the kids. It’s familiar to my daughter, which makes it a safe, understandable and friendly place. 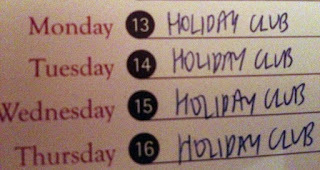 More specifically, it’s somewhere else, a change of scene, and will involve the packing of a suitcase, the playing of the holiday playlist in the car, the sleeping in a different bed, the staying up late watching kids’ films, the stocking the freezer up with lollipops, the smell of sun cream (hopefully), water gun fights, and a few well-earned beers (these are for us parents, not the kids, that would be wrong). I just had a visceral flashback watching that music video. Me and my husband saw The Dandy Warhols perform in a dodgy little venue in Milton Keynes 14 years ago, when my daughter was a bump in my belly. We left just before the end, as it was boiling hot and I was feeling a little dizzy. I remember the muffled sound of them playing this as we walked through the car park, and how we sat listening to it in the car with the windows wound down. God, music can teleport you, sometimes, can't it? The summer holidays are in full swing, which means the necessary survival tactics have been employed in our household. No, the masterplan for keeping a child with Prader-Willi Syndrome happy when school is out, is simple: keep ’em busy. (By the way, dinner is sandwiches and tea is the main meal in our house. I read an article recently asking celebrities what they called their meals. It then explained how having 'tea' indicates that you're working class, northern, or something else I can't remember because I was so bored by this point I gouged my eyes out with a Biro). And in between each of these there needs to be an activity. In this way, the day is filled. School, and its rigid timetables are ideal for this. Holidays, and their fluid, changeable plans, aren’t. Vagueness isn’t acceptable. We need to be a few steps ahead of the question: “What are we doing today?” And it really is best if once you have made plans, you DO NOT DEVIATE from them. We’ve joined the time-consuming library reading scheme, we’ve visited friends and family, we’ve fattened up some already chubby ducks, we’ve explored a range of parks in the sunshine, and we’ve dusted off some board games when it’s rained. And this week, for four days, she’s out, making cardboard Olympic torches and playing mini-golf and singing and dancing and having fun at the local church’s holiday club, run by a load of rather lovely, cheerful and enthusiastic people. I have the feeling my daughter and I might be having a few awkward conversations about religion at the end of a week of frankly shameless brainwashing, but hey, if The Moonies had been running a camp that would have kept her smiling and entertained for a week, I’d have considered that, too. Have you any idea of the peace and tranquility of four whole days of respite, where my daughter is looked after brilliantly, and my day is mine, all mine, to enjoy and luxuriate it? Deciding to have another child wasn’t something we took lightly. It was five years before my daughter was strong enough for us to consider it. Once we were sure we could cope with the pregnancy lottery again, it took another five years before our numbers came up and we beat the odds. So she’s got a little brother. A little whirlwind who’s somehow now well on his way to being four years old, although I’m not sure how this has happened so fast. Having Prader-Willi Syndrome means our daughter’s life revolves around food: she has to be on a strict, low-fat diet, despite being constantly hungry. Not having Prader-Willi Syndrome means our son’s life revolves around Spiderman, saying “poo”, “bum” and “willy” and not having time to be be especially interested in food apart from chocolate and cakes. So how does our daughter cope? We wrestled with the idea of not allowing our boy sweet treats, but felt it unfair to penalise him because of a condition his sister has. Our solution, as usual, is a compromise: he has stuff she’s not allowed but usually when she’s at school and he’s already home from nursery. If she is around then the forbidden food will only be dished out to him at snack or meal times when his sister can have her own low-fat or low-sugar alternative, as part of her carefully-timed, carefully-controlled diet. She doesn’t feel like she’s missing out because she’s excited and thrilled by what’s on her own plate. At the same time, she definitely clocks what he’s got. 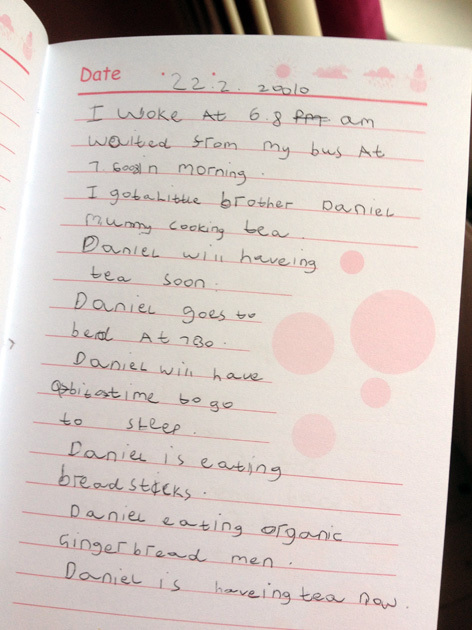 "Daniel will be haveing tea soon. Daniel goes to bed at 7.30. Daniel will have a bit of time to go to sleep. Daniel is eating organic gingerbread men. Daniel is haveing tea now." There are some things in life that are high on my list of “Stuff I Must Do More Often.” Standing in a shop trying to keep a lid on my daughter as her mounting panic threatens to spill over into hysteria is not one of them. The shopping trip started so well. 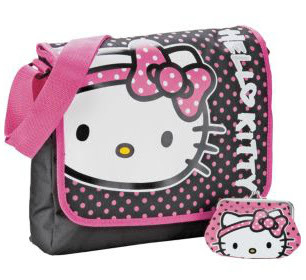 After some heavy Googling she had announced that we could buy her Hello Kitty-branded messenger-style school bag for next term from Argos, just down the road from us. I reserved it online and we headed into the store, while her dad and her brother went to look at the fish in the pet shop next door. I didn’t want him getting overexcited and begging me to buy toys for him. And my little boy’s got quite a bad track record, too (boom tish). So the system worked. After paying, we collected the bag and I handed it to her in its cellophane wrapper, making the fatal mistake of feeling smug that I’d sorted this out so close to the beginning of the holidays, thus fending off nuclear-grade nagging. Her face fell. She examined the package closely, and announced it was the wrong colour. My heart sank. I knew this wouldn’t end well. Her jaw was set. Her heels were cemented in. Her voice was getting louder and louder. Other customers turned round and began giving us looks; one woman in particular began to audibly tut. There’s nothing like strangers judging you to really help calm you down in a situation like this, but I ignored her. My daughter was now in danger of becoming hysterical, and I needed to find a solution. I managed to keep my voice calm and even. This continued for what felt like hours, but was probably around ten minutes. Three members of staff, the Argos computer ordering system, and their bloody uselessly laid-out catalogue were brought into play. My daughter's voice, which when she gets panicky is like an armour piercing missile for the lugholes, reached hitherto unimagined volume levels. Heads continued to turn, but I resisted the urge to give them all a collective "JUST PISS OFF!". The boys returned from the pet store wide-eyed at the sight of our girl standing in the middle of the shop, about to reach meltdown level. She agreed. Her lip was quivering, her hair was flopping over her face, where it had come loose from her hair slides, her eyes were wild and teary. But she agreed. We went home, feeling like we'd returned from a battle, not a retail experience. All is quiet on the Western Front since. I get the feeling I’ve not heard the last of this, and somehow, somewhere along the line, this Company Quartermaster is going to have a mutiny on her hands over the wrong supplies for the troops.